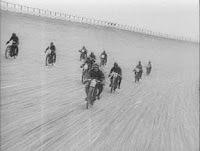 This is an amazingly clear and well-preserved video of American motorcycle board-track racing (click here). Judging by the motorcycles and the military uniforms on some of the onlookers, I'm guessing the video was shot between 1910 and 1920. At a time when street cars topped out at about 35 MPH, these motorcycles were lapping at about 100 -- without brakes. This video shows a long track claiming to be in Daytona; I'm skeptical of that. But it must've been a rare long track as I believe most board tracks were short, very high-banked velodrome-type tracks. In addition to the pioneering racers, front row spectators were occasional casualties. Yup, this was back when "men were men"...sometimes very splintery men at that. All that and no brakes. Simply amazing! Imagine the "wood rash"! BTW, there was a board track in Altoona.